Controversial and often offensive stand-up comedian Andrew Dice Clay made his debut as a feature film star in this crude comedy. 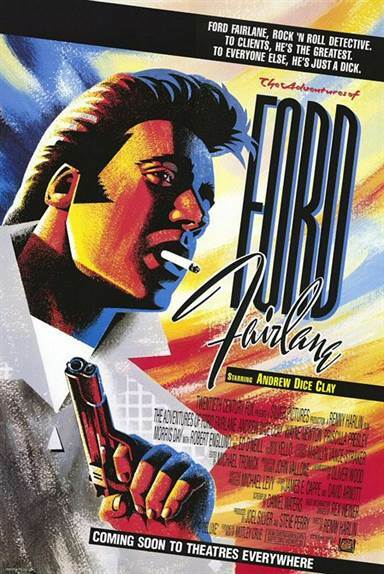 Fairlane is a "rock and roll detective" who works in the music business, has an office on Sunset Boulevard, and drives a 1957 Ford, with clothing to match. He floats through the rock clubs of Hollywood, picking up women and clients, and soon stumbles into a case involving the death of a heavy metal singer, a corrupt music executive (Wayne Newton), the murder of a radio shock-jock (Gilbert Gottfried), and the kidnapping of the jock's daughter (Maddie Corman). Music stars like Sheila E. and Motley Crue singer Vince Neil also have cameos in the film, which attempts to transplant Clay's aggressively obnoxious stage persona into a movie environment. The Adventures of Ford Fairlane images are © 20th Century Fox. All Rights Reserved.